Discover the flavors, art and culture of Chicago's Latino community during your visit. Between Pilsen, Little Village and Humboldt Park, Chicago boasts some of the most vibrant Latino communities in the country. This city boasts cultural institutions like the National Museum of Mexican Art, jaw-dropping public murals created by renowned Latino artists and delicious Hispanic-inspired cuisine around every corner. Since opening in 1962, Nuevo Leon Restaurant (1515 W. 18th St.) has developed into one of the Pilsen community&apos;s most popular restaurants. With authentic Mexican cuisine and their famous New York strip steak dish (Filete Nueveo Leon), this place offers a genuine taste of Chicago&apos;s Hispanic flair. Known for their Tres Leches (three milk cake), Kristoffer&apos;s Café & Bakery (1733 S. Halsted St.) is a true Mexican sweet shop located on an art gallery-decorated stretch of the Pilsen neighborhood. Besides their award-winning baked goods, Kristoffer&apos;s showcases specialty coffees from throughout the world, including "La Perla de Oaxaca" from Mexico and "Los Inmortales" from El Salvador. Logan Square is home to some of the city&apos;s trendiest restaurants, breweries and cocktail bars. D&apos;Noche (2710 N. Milwaukee Ave.), a celebrated Latin Fusion restaurant in the neighborhood, is famous for its inviting atmosphere, powerful Latin flavors and jibarito any time of day. For authentic Ecuadorian fare on the Chicago&apos;s Northwest side, visit La Peña (4212 N. Milwaukee Ave.) in Portage Park. Besides perfectly seasoned grilled steak and unbelievable ceviche, La Peña often features live music in their spirited dining room. The skirt steak at Las Tablas (4920 W. Irving Park Rd.) has been called the best in Chicago, but this place offers more than wonderfully-spiced beef. Their Columbian-inspired menu features an impressive collection of seafood and one of the Midwest&apos;s most celebrated empanadas dishes. For skirt steak, tilapia tacos and braised meats that remind you of Guadalajara check out Lincoln Square&apos;s storefront eatery, Los Nopales Authentic Mexican Restaurant (4544 N. Western Ave.). Since opening its doors in 2005, Lost Nopales&apos;s has developed a reputation for its explosive flavors and charmingly relaxed dining environment. With a Latin-inspired menu that draws influence from Puerto Rican, Mexican, Cuban and contemporary dishes, this charming café in the Pilsen neighborhood is a must-visit for lovers of creative cuisine. From brie and pear quesadillas to hamburgers with chipotle ketchup, May Street Café (1146 W. Cermak Rd.) 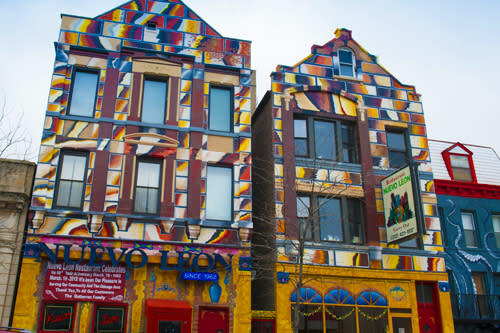 mirrors its Pilsen neighborhood by providing a Mexican flare to its diverse community. Described by Mayor Rahm Emanuel as Chicago&apos;s "second Magnificent Mile," this bustling commercial district on 26th Street provides a variety of Latin-inspired shopping, dining and nightlife options. Located in Little Village, the city&apos;s largest Mexican community, this area offers an expansive and authentic Latin shopping experience. To explore this space, visit 26th St. from California Ave. to Kostner Ave. Thanks to a collaborative effort between the Chicago Urban Art Society, National Museum of Mexican Arts and Pawn Works, Art in Public Spaces was born. Art in Public Spaces turned otherwise neglected areas of the Pilsen neighborhood into masterpieces of large-scale, public artwork. Featuring glass-tile mosaics, graffiti art and enormous depictions of Mexican icons, the Pilsen Murals are an inspiring symbol of the neighborhood&apos;s unconquerable spirit. 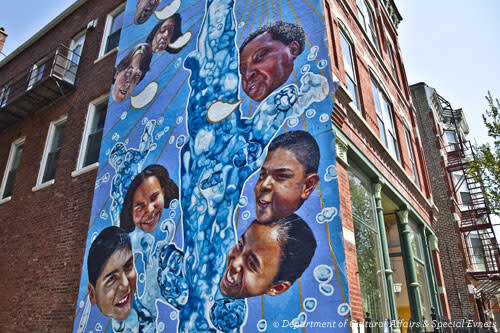 Visitors interested in exploring the Pilsen Murals should walk the area bounded by 16th street to the north, the Chicago River to the east and Western Avenue to the west. 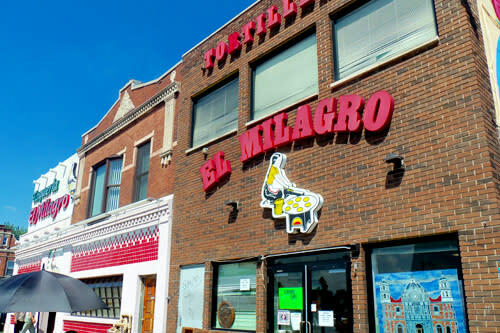 Pilsen&apos;s rich cultural history is everywhere in the neighborhood, even its ‘L&apos; stops. Adorning the 18th Street and Damen Avenue Pink Line Stations are a collection of murals by internationally renowned artist Francisco Mendoza and students of Gallery 37. The murals illustrate various aspects of Mexican culture, including a must-visit, multi-media mosaic by Angel Chavez called "Vida Simple" at 2100 S. Damen Avenue. The Humboldt Park Mural Program was created to restore decaying works of public art while, simultaneously, showcasing the neighborhoods creative vision. Today, Humboldt Park boasts more than 60 incredible works that proudly connect onlookers to the area&apos;s rich Latino culture. Visitors interested in exploring the Humboldt Park Murals should walk the area bounded by Western Avenue to the east, Division Street to the south and Rockwell Street to the west. 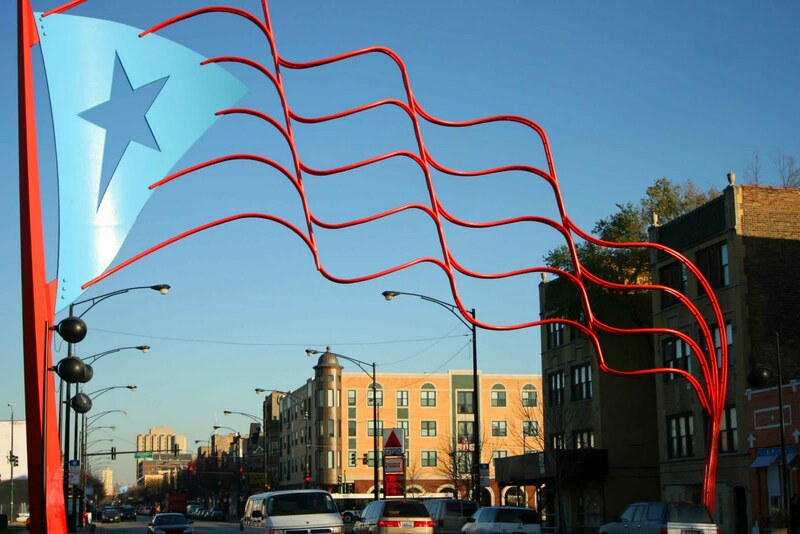 In 1995, Chicago gifted a pair of enormous metal Puerto Rican flags (Division St. at Western Ave. & Californian Ave.) that measure almost 60 feet in height to the Humboldt Park neighborhood. These twin sculptures are a proud symbol of the neighborhood&apos;s deeply rooted Latino pride and serve as a gateway to Paseo Boricua, a stretch on Chicago&apos;s West Side commonly called "little Puerto Rico." When its doors opened in 1987, the goal of the National Museum of Mexican Art (1852 W. 19th St.) was to establish an organization committed to accessibility, education and social justice. 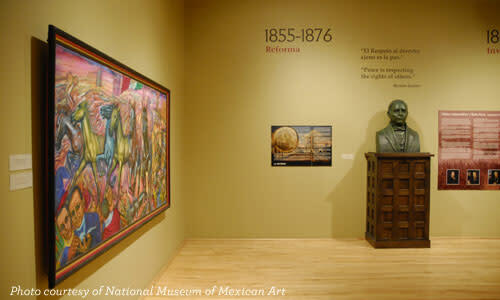 Today, the museum is a national authority on Mexican art with a 48,000 square-foot, state-of-the-art facility. Located in the Pilsen neighborhood, the Museum vaunts more than 7,000 seminal pieces from ancient Mexico to the present, one of the largest collections of its kind. Celebrating the best of Puerto Rico&apos;s rich history, the Institute of Puerto Rican Arts & Culture (3015 W. Division St.) is a one-of-a-kind Chicago institution. Visitors can expect an active calendar of visual exhibitions, films and fine art displays. The Institute of Puerto Rican Arts & Culture recently underwent and multimillion dollar renovation to turn the historical structure into one of the most architecturally distinguished buildings in the area.